Salwar Kurtas for female King 11 suppoters! Katrina Kaif tries 200 gowns! Lady luck : Katrina for Subhash Ghai's "Yuvvraaj"
Sammir Dattani walks the ramp! Shahid Kapoor- A big hit with kids! No Time bound for Kim Sharma!! Katrina Kaif : Crystal clear about her career! Taal se taal mila…. Great going at 86! Kareena Kapoor to launch her own web site. 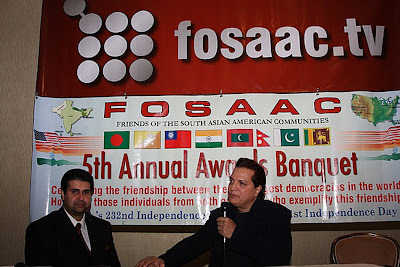 Music Director Jatin Pandit has now been honoured with the 5th Annual FOSAAC Friends of South-Asian American Communities Award, one of the biggest South-Asian Awards at Los Angeles. This year's theme was celebrating the friendship between United States & India and Jatin Pandit received the FOSAAC RD Burman Award for outstanding achievement in music & for composing the album America Mein India, a sensational hit in USA. 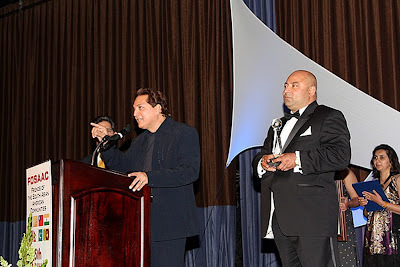 The award was given at the International Ballroom, Beverly Hilton Hotel, Beverly Hills, California USA. This ballroom is the home of the Annual Golden Globe Awards for Hollywood. FOSAAC incidentally, has raised $1 million for Hillary Clinton's Presidential Campaign. Said Jatin, "I feel highly elated receiving such a prestigious award amongst such an august gathering. Being the first Indian composer to receive this award, I am touched that my lifetime work is now getting recognized on an International platform, thanks to FOSAAC." Jatin also regaled the audience with the song Chand Sifarish from Fanaa to loud applause. 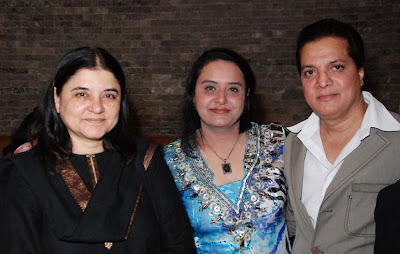 The Kalpana Chawla Award for contribution to Society went to Maneka Gandhi, Anne Archer, Academy Award nominated actress for her role in Fatal Attraction was the recipient of the Mother Teresa Award for Outstanding Contribution to Society, Nancy Cartwright, the voice of Bart Simpson and many other voices on "the Simpsons", was awarded the Mahatma Gandhi Award for Humanitarian of the Year, Two-time Emmy award winner, "the Young and the Restless" actress Michelle Stafford, received the Sardar Vallabhai Patel Award for Outstanding Leadership, DNC Vice-Chair Mike Honda was awarded the Dalip Singh Saund Award for his Outstanding Political Contribution to Indo-American Society and Imran Khan, cricketer and philanthropist who received the Mother Teresa award for Outstanding Contribution to Society. 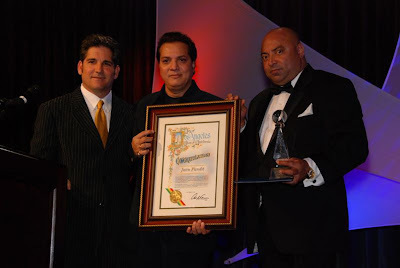 The chief guests were Los Angeles Mayor Antonio Villaraigosa & Los Angeles County Sheriff Leroy Baca – a rare occurrence to see both attending the same event. Orange County Supervisor Chris Norby was another Guest of the evening. A major highlight of the evening was the Oscar-style presentation of all awards with its glamorous visuals & laser show. The spectacular entertainment portion of the night's festivities included wonderful performances by acts from both American and Indian Communities: musical performances by Jierra Clark, Michael Duff, and various musical selections played by violinist Andrea Hammond. In addition there were breath-taking performances by the Fire Groove troupe of Hollywood, and sensational songs & dances by Indian performers Noopur Dance Academy, and Rasalila.